1 Could you tell me more about your volunteering initiative and why you have joined? Habitat for Humanity Poland partners with people in the community to help them build or improve a place they can call home. Habitat homeowners help build their own homes alongside volunteers from all over the world and pay an affordable mortgage. Habitat homeowners achieve the strength, stability and independence they need to build a better life for themselves and for their families. As Habitat we bring people together to build homes, advocate for housing and promote dignity and hope. 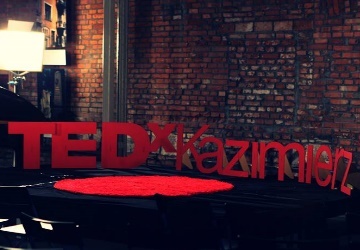 2 Why do you volunteer and what you you know about TED and TEDx? Volunteering is one of those activities that at the same time works very well for the both parties involved. It helps you, at least a bit, to get out of your comfort zone, put things into perspective, gain new skills, new friends and sense of community, share and learn – and all that through dedicating your time to helping someone else. 3 How do you contribute to the volunteering initiative? I work as a Volunteer Coordinator and try to do my best to make volunteering easy, fun yet meaningful for people who support us locally and internationally. What was the funniest, strangest or most interesting experience that you would like to share since you came to Krakow? 4 Anything else you want to share? 5 What do you want to achieve for yourself but also for other people? I think good things happen when people get together over good purpose – helping those in need is one of them. I would love for volunteering to be more popular in Poland and for people to see the true value in that.